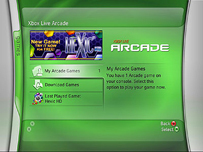 David Edery, worldwide games portfolio planner for Xbox Live Arcade, has been giving out some advice to developers hoping to sell more titles based on their game demos offered over online networks such as Xbox Live and PSN. Edery begins by stressing the value of PR and building a buzz around a game. “Having a free trial does not exempt a downloadable game from taking advantage of PR; not even in XBLA, where every game gets downloaded by a large number of people.” Lots more people could still be persuaded to download demos, he says, and secondly, “conversion rates are influenced by anticipation”. Edery lists a number of what he views as common mistakes made by developers, including frustrating gamers with overly-difficult demos that don’t feature tutorials, demos that are too short or too long, and demos that don’t grab the attention of gamers within the first three minutes, as well as advice for countering such hiccups.